Today we had a great first day in Istanbul the city of Asia and Europe. In the morning we went to the magnificent Blue Mosque built 400 years ago by the same stone masons that built the Taj Mahal! Its wonderful in Turkey how foreigners are welcome and able to enter Mosques, this should be the case everywhere. We have also been getting lots of Turkish tea, it comes in regular like a British black tea blend and fruit flavors, the apple is wonderful. I will definately be taking some home. Locals don't seem to add milk to their tea or coffee (yep Jenn I had one for you!) so I ended up buying buttermilk in the grocery store! We went to the Grand Bazaar it was amazing and we will return but it was hot and crowded and little Jasmine fell asleep in our arms so took the metro to the galata bridge for fish. I tried to find a recommendation by a fellow blogger but with a sleeping babe we settled for one under the bridge and little Jasmine took her nap! it was cool as you could see the locals fishing over the bridge and see their lines in front of you! Look at the fishing lines above! wow look how old the spice bazaar is, Istanbul sits between Asia and Europe and you can see the influence of Indian spices and ones of the Mediterrenean truly fascinating, again we plan to return I want the meatball seasoning and fish one! Turkish delight we got a lot of samples as the store keepers kept giving it to Jasmine, folks here adore kids and are very kind to families, an older gentleman gave up his chair for me when Jasmine was sleeping and of course free cakes! Simit folks tell me its like a Bagel there is a baker a few minutes walk from our apartment so I think this will be breakie! I am passing out over on this side of the pond you lucky girl you! Rebecca, what a fabulous bazaar. Looks like you're having a great trip. Keep these great posts coming. We're loving it. Oh what fun, looks fabulous! Wish I could be there with you! Can't wait to see more! Oh I truly should have been born in Istanbul! Everything looks amazing. I am so jealous! I wish I was there. That looks like such fun Rebecca! Wow! Love all of the colors in the market! Can't wait to see the rest of your pics from your travels! How beautiful! Thanks for sharing your adventures with us...those spices truly look amazing, how are you not diving into those bins!? HA! The photos of the spices are truly inviting. I can imagine the delectable aromas. The colors, the busyness. What a fabulous experience. I love looking at all the pictures. You are in the country of my dreams. I will note down tips from you and check it out when I go there. Yes, "When" is the active word here. I am so jealous. Looks like an amazing experience. Now I want to go. Oh well, at least I am going to Europe soon, and Morocco. I am really looking forward to Moroccan food. I will be posting on my blog soon about my upcoming trip and I hope to be able to post while I am traveling. Thank you for sharing these images from your travels. 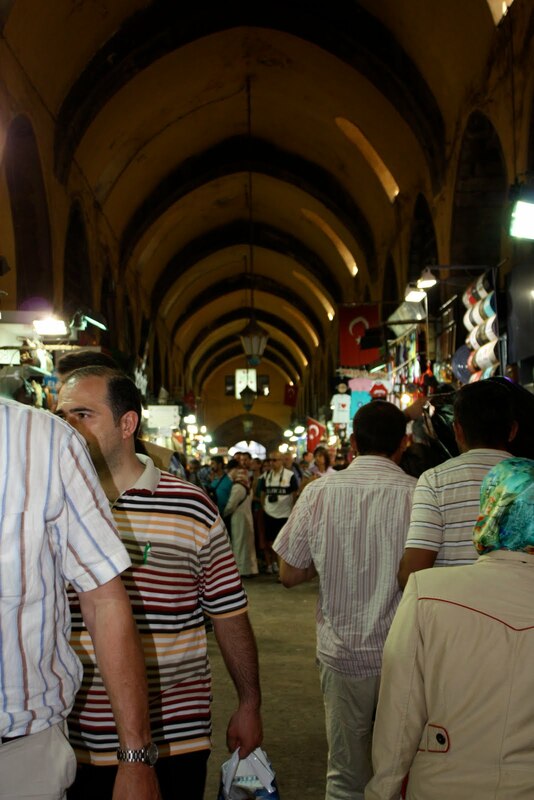 I would absolutely love to spend a day in the spice bazaar - what a fantastic oppotunity!! Lucky you! The lamps look so beautiful. My grandpa was from there and I know how marvelous is this city and the market. That fish dish looks fabulous! Yummy! Those lamps are so beautiful!! What an amazing place. Thank you for sharing. The food looks wonderful! Look at all those spices!! I have the hardest time finding Indian spices in my city. Great pics. The bazaar looks fabulous. What fun. Thanks for taking us along. 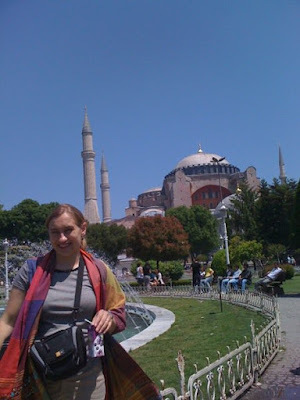 I really need to plan a trip to Istanbul! Lovely photos! Have fun dearie.....looks lovely. 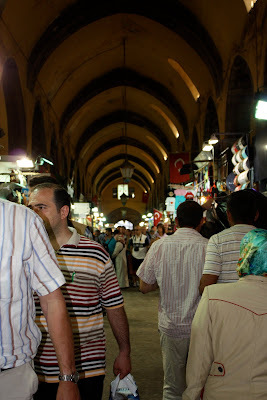 I wish I was at the bazaar, soaking up the heady scents of spices! that's so much fun.. travel can get challenging with a child but I'm glad you are still able to enjoy the cool things... never been to Istanbul before but I can imagine the beauty of it... much love back! I am retracing my steps with you; I was there at Christmas and both my daughter and I fell in love with Istanbul; but my favorite time was at the Spice Bazaar; I bought some apple tea (the natural kind, with bits of dried apples) to take home as well as some sahlep (for making ice-cream) and also some spices for kebabs. Enjoy it !